On a narrowing strip of land in downtown San Jose, a virtual isthmus locked by streets and intersections on all sides but one, Aaron Green Associates successfully integrated a small professional law office. Only a single story building on a slightly sloping site, it was elevated just enough to allow ample business parking to occur at semi-subterranean level below grade. This allowed for maximum development of floor area for the office within the overall limited space available. The remaining site outside the setbacks were landscaped by Aaron Green Associates with careful attention towards screening the parking area, partially below grade. In the early 1990’s, the City of San Jose’s Redevelopment Agency began pursuing a high-density housing project for the greater area in which the building unfortunately stood. 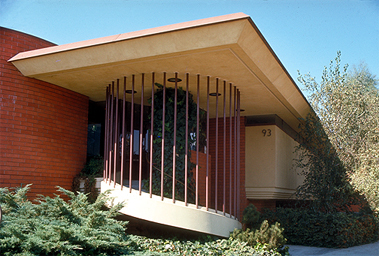 Although the office structure was much admired by professional architects of the South Bay who fought valiantly for its Landmark Status, the Weir Office building was ultimately demolished.